Technology Services at FAA maintains a variety of hardware products designated as "loaners." These products are intended to be used for University-related business, academic duties, testing before a potential purchase, and short term loan while equipment is repaired or replaced. The program is not to be used to permanently replace damaged, lost, or stolen equipment. The borrower must present a valid I-Card upon receipt of loaner equipment. By borrowing one of these items, the borrower acknowledges their agreement to these guidelines. For a full list of available equipment, please visit the College of FAA: Loaner Program Equipment Details article. All loans are subject to availability of equipment for the time period specified. If the equipment that is requested is not available, Technology Services at FAA will contact you to discuss potential alternatives. 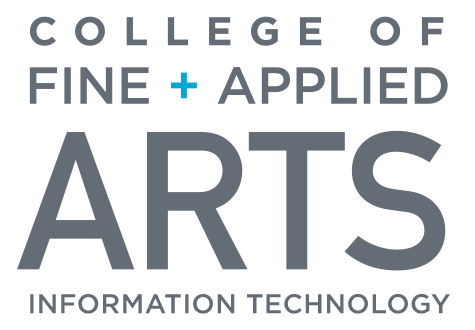 Any faculty or staff member in the College of Fine and Applied Arts is eligible to check out one or more pieces of equipment. Faculty or staff outside of the College may make arrangements with Technology Services at FAA, if equipment is available. Undergraduate students are currently not eligible for this program. Faculty/Staff members must provide IT with at least 24-hour notice if they are going to reserve equipment, otherwise the equipment you want may not be available. Reservations can be made through the IT Equipment Loaner request form. Equipment is loaned out Monday thru Friday during normal 8 a.m. to 5 p.m. business hours. Delivery to an office on campus can be arranged with at least three days notice. The limits below are in place to ensure maximum availability of equipment. Note: if you require a longer loan period, please contact Technology Services at FAA and we will try to accommodate the request if possible. Renewals are available after time has elapsed if someone hasn't reserved the equipment. Laptops can be loaned out for a maximum of one month at a time. Tablets can be loaned out for a maximum of two weeks at a time. Audio / Video equipment can be loaned out for a maximum of one week at a time. In most cases, only one piece of equipment of each type will be loaned out to an individual at a time. Special arrangements with enough advance notice made be made. All personal data (including but not limited to files, email, pictures, and documents) is the user's responsibility. After loaner hardware is returned by the user, the files will be immediately deleted from the laptop. Borrowers are responsible for returning equipment in the same condition as when they received it. If there is damage to a device requiring the device to be replaced, the borrower is responsible for those costs.